There are over 240,000 grocery stores in the United States alone, each one catering to the specific needs of its community. We address the needs of the stores and owners themselves so they can better serve their customers. Local supermarkets and grocery stores have among the very highest electrical and energy intensity ratings of all commercial buildings. They also have some of the greatest potential for energy savings. CLEAResult offers a wide-ranging suite of complex refrigeration measures, as well as upgrades for lighting and HVAC. We customize our solutions to fit the unique needs of each facility, and our account managers provide a single point of contact to guide customers through every step of the process. With GrocerSmart®, our proprietary auditing, modeling and measure-recommendation software, we help customers understand the options and long-term benefits of investing in their facilities. 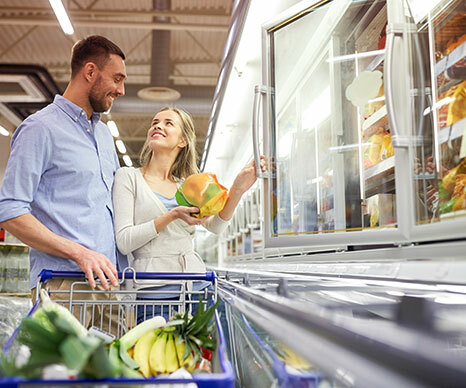 GrocerSmart® can be configured to be a one-stop shop, or as targeted approaches to new construction, remodels, retrofits and retrocommissioning, creating more comprehensive energy savings and increased customer participation. We've improved energy performance at over 11,000 stores, saving utilities and their customers 825 million first-year kWh—a cumulative 3.4 billion lifetime kWh!